It seems now that we’ve made another transition. Research has shown that not only is it difficult to visually assess elements of gait, but even with the best equipment, we can’t predict what type of movement is detrimental or know what shoe is going to help or hurt them. Some people naturally roll far inward with no ill affects, some experience the same level of roll because of weakness and it causes stress on their knees. Some people kiss the ground softly with their heels while others slam down hard on their toes. Some people’s feet naturally turn inward, some outward. What we do know, however, is that each runner’s body and mind has a highly-sensitive system to assess what works for them. Like the umpire who gives up trying to figure out exactly where the ball crosses the plate because he is the ultimate authority, we don’t need to determine what should work for our mechanics—we are the ultimate authority on what does or does not work. There is the right shoe for you, and the wrong shoe for you, but there is neither until you call it. How do we make the call? By running in shoes, lots of shoes, and paying attention. Start by throwing out your assumptions. Shoe designs have changed, our understanding of how the body works has evolved, even your stride may well have changed. Don’t be limited by a previous “diagnosis.” Try out thin models and thick models, ones that bend and ones that roll, squishy ones and firm ones and bouncy ones. Experts agree (and research backs it up ) that the shoes that will keep you happy and healthy will be the ones that feel the most comfortable. The “comfort filter” insures that the shoe is allowing you move in your natural, preferred movement pattern while providing necessary support. This comfort filter, however, involves more than plush step-in softness. 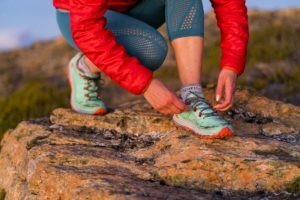 In the right shoes you’ll feel everything fall into place on the run: where you land, how it rolls, how stable you feel, how well it cushions and pops, and—most importantly—how well it fits the shape of your feet. You won’t notice the shoe, but you’ll feel great. While you’re sorting shoes, you may end up with a small pile of those that feel “right”—even ones with dramatically different properties and profiles. No worries. Experts also agree that while there may be some “wrong” shoes for you, there is no one “right” shoe for any of us. In fact, research clearly shows that those who vary their shoes suffer fewer injuries. Running in different shoes alters the forces transferred through your feet and legs so each run doesn’t pound the same systems and you develop a variety of muscles and movement patterns. Not having to choose one shoe “’til death do us part” can let you play the field and decide day to day what feels best. You may want to fool around with a model that has a lower drop or a more flexible ride, taking it out only on short, fast days. You may reach for a shoe that will coddle you, or support you, on those days when you’re tired and beat up. Some days you may choose a close-to-the-ground zero drop and some days you’ll want some lift under your Achilles. 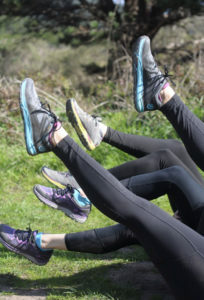 “I think it’s good to fluctuate between them depending on the workout,” says podiatrist Rob Conenello, past president of the American Academy of Podiatric Sports Medicine. Don’t worry, your daily trainers won’t get jealous, and your feet and legs will thank you for the variety. In this process of selecting the best shoe(s) for you, the shoe fitter at your local running store is still your best friend. She or he can measure your feet, help you find models that fit best, and be your expert guide to the variety of options. But remember, in the end, there are neither good shoes nor bad shoes until you make the call. Don’t let anyone tell you differently.